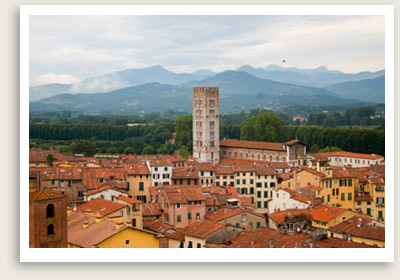 Lucca Tours Include: Lucca tours include private “driving guide,” private roundtrip transportation, taxes, tolls and parking. Optional: Licensed local guide for museums, churches. Enjoy a private day trip from Florence and embark on a guided tour of Lucca, one of the most graceful and elegant cities in Tuscany, with an English-speaking guide. NOTE: Other departure points available. Founded by the Etruscans, Lucca became a Roman colony in 180 B.C. During the 12th century, it enjoyed a period of prosperity based on the silk trade. Lucca remained an independent republic for over 500 years, until Napoleon came along and created the principality of Lucca. Everything is contained within Lucca’s wide, well-preserved Renaissance city walls – 2.5 miles around – and you will stroll in search of Lucca’s highlights, from its charming squares to the beautiful churches of San Martino and San Frediano. You will also glimpse the city’s Roman past in Lucca’s market square and medieval quarter. You will have free time to stroll around this charming town, walk the city walls, climb the Guinigi tower, and enjoy the shops at Via Fillungo. Sites not to be missed include the cathedral of San Frediano, where you can view the body of St. Zita in a glass coffin, and the Ampitheatre, an elliptical Roman colosseum on which houses have now been built.